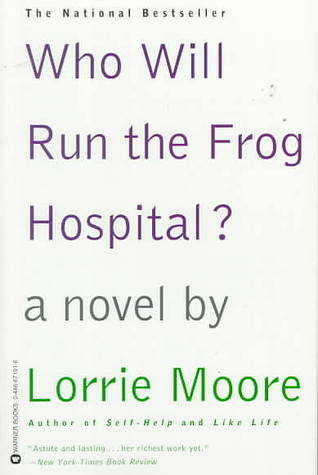 Literary Lindsey: Review: Who Will Run the Frog Hospital? I absolutely LOVE Lorrie Moore. Have you read A Gate at the Stairs? Favorite! I've been meaning to read this one for ages and still haven't done so. I feel that many of her stories are somewhat disconnected and really defines her style. However, I think it's that and the dialogue between characters that really makes her work so enjoyable and different from other writers. You've reminded me that I need to pick her asap. Great review, Lyndsey! I have read A Gate at the Stairs, but I haven't read any of her short stories! I must get to that one of these days. Despite its flaws, this sounds terrific. I love the way you described it as a quiet, sincere look at coming of age. While it is about teenagers, it feels very different from our modern YA. I hope you get a chance to read it!